If you don’t think healthcare has gotten really expensive, try spending two or three days in the hospital. I was hospitalized for four days a few years back and my total charges were more than $36,000. And I had a minor procedure last year that cost $6,000 and didn’t even involve a hospital. Fortunately, my healthcare insurance covered all but $600 of the $6,000. Let’s say you had to make a trip to the hospital that resulted in a $36,000 bill like mine. Whether you have insurance or not, the first thing you should do is sit down and go over it line by line to make sure you’re not being billed for services you didn’t actually receive. You can probably skip over the minor charges but be sure to look for big items such as an MRI or CAT scan. If you don’t remember getting any of the services for which you’ve been billed, mark them with a highlighter for future reference. In the event you have health insurance, all you need to do for now is wait until you’re told how much of that $36,000 is covered – or will be paid by the insurance company. Read your policy very carefully to make sure you understand which costs were covered and which weren’t and any co-pays you’re required to make. That way you’ll know if the insurance company is playing fair with you. If you feel it’s not for any reason or if you disagree with the co-pays or limits on your coverage, you will need to meet with your HR department or insurance agent to get the differences resolved. If this is the case, you will need to meet with the doctor, hospital or clinic responsible for the bill. If you found errors when you reviewed the bill, you will need to bring these to the provider’s attention and ask that they be deleted. Barring this, you have several options for dealing with that bill or bills. I saw a report recently that healthcare providers often inflate their charges by a multiple of 3x or 4x because they don’t really expect to collect the full amount. This means you might be able to negotiate that $36,000 bill down to $9,000 or less. Step two is to ask for a payment plan. Most hospitals and clinics are willing to work with patients who can’t afford to pay their bills immediately. You could ask for one, two or even three years to pay off your bill. Of course, you may have to pay interest because you are, in effect, borrowing money from the hospital or clinic. A second option for taking care of that big bill is be to put it on your credit card – assuming you have a high enough limit to cover it. If not, you might be able to spread it across several credit cards – putting maybe $5,000 or $7,000 on each of two or three cards. You could then pay off the bill at your own speed. 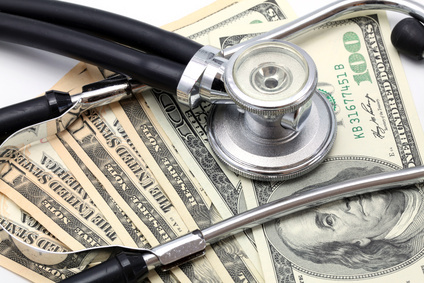 One of the biggest reasons why people file for bankruptcy these days is due to big medical bills. If you’re uninsured and can’t see any other way to pay that huge bill, you could file for a chapter 7 bankruptcy. This would discharge almost all your unsecured debts, including any medical bills, credit card debts and personal loans. Chapter 7 bankruptcies typically take about six months and cost anywhere from $500 on up. A fifth way to deal with big medical bills is to let us negotiate settlements with your creditors. Our debt counselors usually negotiate settlements that save our clients thousands of dollars. While debt settlement will affect your credit score, it won’t be as bad as if you had filed for bankruptcy. Plus, it’s a more ethical way to handle your debts vs. a bankruptcy where you basically stiff your creditors for everything you owed them.